Here are the ten most popular news articles, week ending 28th August 2016, covering catastrophe bonds, ILS, reinsurance capital and related risk transfer topics. To ensure you never miss a thing subscribe to the weekly Artemis email newsletter updates. Last week Italy was hit by a deadly earthquake, with more than 250 reported dead. The Azzurro Re I cat bond is thought to have escaped any loss, but with an estimated $11 billion of economic losses the toll for insurers and reinsurers could be at least the EUR200m estimated by Fitch. Is blockchain a solution in search of a problem? For the insurance industry, there’s been plenty of chatter about distributed ledger technology and smart contracts, but take-up has been thin. All eyes in Florida and the Gulf Coast states will be on Invest 99L, a strong tropical low that is currently tracking west-north-west between Cuba and the Bahamas towards Florida, could develop into named tropical storm Hermine and which is forecast to pass into the Gulf of Mexico. The Insurance Council of New Zealand said that private insurance and reinsurance firms have now paid out more than $18 billion to settle commercial and residential claims from the Canterbury earthquakes, but ever since the quakes the magnitude of the loss has been filled with uncertainty. Despite the fact that U.S. flood events are largely paid for by the National Flood Insurance Program (NFIP) and primary insurance, where flood is a covered peril, the recent severe floods in Louisiana could see some of the burden covered by reinsurance capital. In the latest in our series of interviews with figures from the risk transfer and insurance-linked securities (ILS) markets, Artemis spoke with Barney Schauble, Managing Partner at specialist catastrophe and weather risk asset manager Nephila Capital. 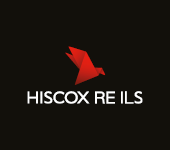 There is a risk that some reinsurance companies may have picked up “unintended aggregations” as they fight to retain business and compete their way through the soft market cycle, which presents a risk of certain firms facing larger than expected losses, according to Fitch Ratings. Cyber risk is reportedly the fastest growing insured peril across the global property/casualty (P/C) insurance space, with the market forecast to expand to $20 billion by the year 2020. With the potential exposure so vast there’s a clear need for reinsurance capital, suggesting opportunities for ILS markets. London market insurance and reinsurance players have historically benefited from playing the re/insurance cycle, but in today’s highly competitive marketplace, post-event profits for the London market are under threat from sidelined capital, says A.M. Best. International ratings agency Standard & Poor’s (S&P) has highlighted the strong enterprise risk management (ERM) practices of global reinsurers as key to success in the current market. But as market headwinds persist and margins continue to thin, the harder it will be for firms to weather the storm. 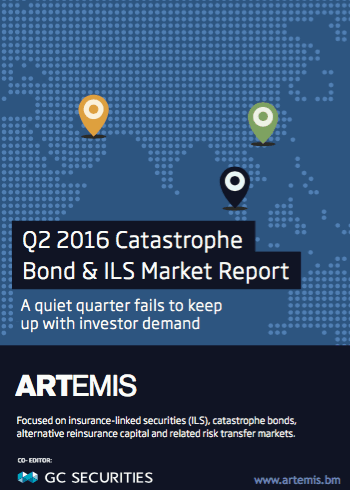 We’ve now published our Q2 2016 catastrophe bond & ILS market report. This report reviews the catastrophe bond and insurance-linked securities (ILS) market at the end of the second-quarter of 2016, looking at the new risk capital issued and the composition of transactions completed during Q2 2016. Q2 2016 issuance failed to hit $2 billion, with just $1.624 billion of new risk capital issued from 14 transactions. This is the first time since 2011 that Q2 issuance has failed to reach $2 billion.